Lime sweetens your soil. In areas where soil is naturally sour (acidic), lime is extremely important for growing healthy turf. 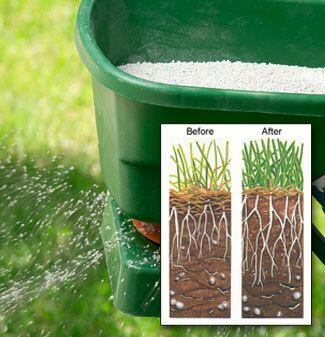 Lime Helps to improve lawn color and density, helps to control thatch, and increases root development. Our lime application helps to keep the chemistry of your soil in balance so that you can have and enjoy a thicker, greener, healthier lawn. When your soil pH is too low (acidic), it needs lime to bring it back into balance. Soil that is too acidic causes fertilizer lock-up. This means that fertilizer and important micro-nutrients become locked up in the soil and are unavailable to the grass. Lock-up may result in grass becoming thin and yellow, thatch building up faster and root growth slowing down. A lawn in this condition is called un-thrifty because even when properly fertilized, it can't make use of the plant food applied to become thick and stay green. We suggest annual liming for acid soils. It helps everything else we do work even better. That's what makes lime such great lawn value for you.